With rimless aquariums becoming the main trend, Mr Aqua introduced to the market a unique dimensional rimless aquarium that is 12 gallons long. Now I personally ordered one to see what the rave was all about and if it’s even worth my time aquascaping it. The reason why this 12 gallon long aquarium is so popular in the community is because of its huge footprint. It clocks in at an incredible 294 inches of substrate space, which is ideal for aquatic plant and shrimp hobbyists. It does have a downside of eating up a lot of money with substrate. Personally for me, I went through about 9 lbs. of Fluval Plant Stratum (with a few hills, of course). More substrate means more room for your shrimp to crawl and graze on. So the rave that is always talked about with Mr Aqua’s 12 gallon long aquarium is how huge the footprint is for shrimp keeping. I personally measured aquarium out and it clocks in at an incredible 294 inches of substrate space! Which means this 12 gallon long aquarium will eat your paychecks up for breakfast with the cost of substrate, unless you are savvy and DIY it. Now I’m not savvy enough so I bought some Fluval Plant Stratum which sucked about 9lbs worth of it into the hardscape (with a few hills, of course). Looking at the Mr aqua 12 gallon aquarium hardscaped, I can now see what people mean with the enormous footprint and how it creates this almost landscape effect of 2D imagery. Mr Aqua made this 12 gallon long aquarium rimless using 5 mm thick glass. This was done in order to remove the eyesore frame rims that had thinner glass types bowing by the force of the water. Mr. Aqua manufactures their glass in Taiwan which matches the “low iron” glass quality that is typically made in China. Mr. Aqua does have other aquariums that are considered low iron but if you do a side-by-side comparison, there is no real difference besides the price. It definitely is beautiful how clear this glass looks compared to some of the other tanks I’ve used and seen before. The bottom of the Mr. Aqua 12 gallon long is made out of 12mm non-tempered glass for marine hobbyists looking to drill holes for sumps. The glass thickness is also there for support if a stand or desk aren’t perfectly flat, causing longer thinner glass aquariums to crack on the bottom from the weight displacements. The dimensions of the Mr. Aqua 12 gallon long aquarium are just incredible. It seems like this aquarium was perfectly made for every lighting company to easily mount onto it, especially with the Current USA Freshwater LED+ or Current Satellite Plus Pro. With the depth and width of this 12 gallon long tank, you can be certain to hit high PAR with any affordable lighting you run across, giving you tremendous growth in a short time, or the freedom to choose a variety of plants. Mr. Aqua seriously created a 12 gallon long masterpiece that is great for newbies but is also tailored for the extreme hobbyists. I talked a little bit on high PAR in the last section but what kind of plants can you grow in this thing? Well pretty much whatever can fit and grow into it really. With only about 8 inches of depth, low light aquarium plants can grow ideally whereas high tech aquarium plants will thrive given the right amount of nutrients, light, and Co2. The seams and joints are precise but from what I noticed, the silicone was not so flush and also thickly applied on the bottom cervices. Is it noticeable? No, once I added my substrate you don’t even see it. This isn’t a bad thing seeing how substrate is going to be covering it up, but if you are very picky, then you might want to look into the ADA brand tanks. The Mr aqua 12 gallon long aquarium is actually one of the best tanks i’ve ever had a chance to aquascape. With these unique dimensions, you have to really use your imagination with depth of field and how to turn this 2D dimensional tank into 3D. I personally went with an iwagumi style for my 12 gallon long because of the sheer length and ability to use space to create a focal point. It’s almost the doppelganger of a traditional aquascape, where you use hardscapes or aquatic plants to create a focal point. Dimensions: 35.4″ x 8.3″ x 9.4″. Float glass is same old glass, while low-iron composition softens the everyday green tint of aquarium glass, permitting greater light penetration and increased clarity. The result’s a considerably improved viewing enjoy, because of the top transparency of the glass. Overall, this tank is structurally sound and just a beautiful aquarium to create your masterpiece with aquascaping. It also is one of the best starter tanks for shrimp keeping with how HUGE the footprint is. The only downside to this 12 gallon long aquarium is the price has steadily gone up which other 12 gallon rimless can be bought for almost half the cost. This being for the thicker and non-tempered glass feature of course. But if you have a desk or counter with 36 inches of space, this is one of the best aquariums to fill in that void for your future aquascape. Previous articleStarting with a Nano Aquarium? Things to know! Can you use a hang on aquarium filter with this tank. It appears you might be using a canister from the images here. I am looking to copy your setup here with the tank and current led light. The Current USA satellite Freshwater LED plus is a perfect fit for this guy. I’m actually growing out a carpet of UG (Utricularia graminifolia) in mine with little effort. It’s such a great shallower tank that it grows almost all the high demanding plants. Don’t know why the Satellite Freshwater LED Plus and Mr Aqua 12 gallon long hasn’t been put into some sort of packaged deal when buying but they are “that” great together! I know this is a bit of a late comment, but I was very interested in doing the 12gal setup with the Current Freshwater LED Plus and have a question. What size light are you putting on the tank? There’s a 24-36 (22.8″ long with adjustable legs), which seems a bit small, and the 36-48 (34.8″ long with adjustable legs), but will it fit on a 35.4″ long tank? Other images I’ve seen online seem to show this tank with a Current LED light that just about perfectly fits end-to-end. Thanks for the advice, great review! A little late to the party, but I am very interested in the Mr. Aqua 12 gallon tank and Current USA Satellite Plus combo. I have a question though. Is the correct size of light to get the 24-36″ (22.8″ long) or the 36-48″ (34.8″ long)? It seems that the 24-36″ one would be too short, but does the 36-48″ one fit on a tank that’s 35.4″ long? If it does, it would indeed be perfect. Don’t ever feel like your late to the party – this review has helped literally thousands of people over the years trying to figure out if this is the right tank for them and/or questions they might have. I know John & Geoff over at Sevenports have said that the 12 gallon long is the most sought after tank in the US. Ok to the question at hand! 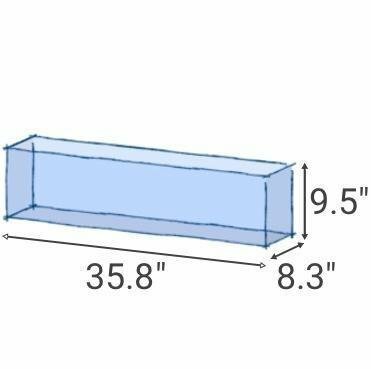 The Mr Aqua 12 gallon long aquarium does come in at 35.4″ outside dimensions but even though the Current USA Satellite Plus says 36-48″, it comes in at 34.8″ long. Which means it does fit perfectly on the 12 gallon long, giving you the most bang for your buck if you are looking to light up the whole aquarium. I do hope this helps, if you have anymore questions – let me know! hi jesse, where did you get your aquarium and do you now how much it was for? I bought my Mr aqua 12 gallon long at marine depot last year for about $120 total (it was kind-of expensive at the time). Right now, I’m seeing the Mr aqua 12 gallon longs going for $72-92. You can also check out green leaf aquariums (east-cost), Orlando is a really good guy and one call will get you all setup. I believe Geoff and the guys at Sevenports are about to start importing 12 gallon long low iron so if you want a cleaner type of tank, you might want to hold out till stores start to get it. I have a 12g long Mr Aqua and love it. My only concern is the fast evaporation rate. Are there any lids or hoods that fit this tank? I have a great LED light system that fits it perfectly, but am willing to switch in order to get a lid or hood. Yeah the Mr aqua 12 gallon long’s do have a quick evaporation rate. I personally can’t recommend any hoods or lids that would accommodate the tank, but here is a link to one that is 36 inches long. Now there has been a few people that went with a sump system either drilling holes or having an overflow box attached to their Mr aqua 12 gallon aquarium. This would gives you more gallons for a bigger bio-load (ie: more fish) while keeping that nasty water line in check. You would simply just fill up the sump ever now and again but evaporation would still be the same. Now if you having curious shrimp or jumping fish that love to test their limits, then definitely look into that lid or even custom making one. Hey Carolyn, I appreciate the heads up. I might actually call Geoff at Sevenports and see what “might” work for the 12 gallon long for the top. I surely thank you so very much as I have spent all day for several days to see what would work. Marine Depot said the metal screens will not work. I called Lowe’s and they want 454.00 plus tax for a sheet of acrylic which is the only way they will sell them and to order from a glass store and to have it shipped is at least $100.00 to much to tack on after buying a $250.00 light also. All of my fish are jumpers so after talking to canopy place, 3 of them and they all said no, I now have cancelled my orders and now waiting. Thanks again. P.S. that was supposed to be $54.oo plus and not 454. Hey Carolyn, Well I talked to John at Sevenports and he told me there isn’t anything he knows about for a top on the Mr Aqua 12 gallon longs. (they are actually discontinued the stands they were making for the 12 gallon longs). If your just looking for a screen for your jumpers, then look into getting a screen lid. 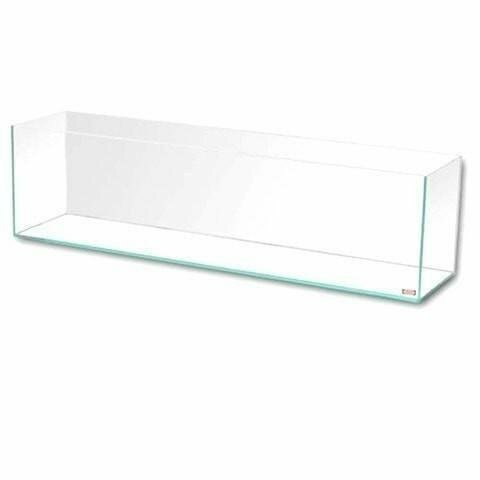 Now this doesn’t solve the evaporation rate with the 12 gallon long but I know from experience with my fluval edge, that having glass overtop is going to heat water a lot quicker – it’s great for winter time but summer I was keeping my light off because it get past 80 degrees. Most tanks with lids aren’t really shallow like the Mr Aqua 12 gallon long. Deeper waters are cooler because light isn’t able to penetrate that deep. (think of going into a lake, the shore is warm but dive into the water and it starts to get brisk-fully cold). Larger aquariums also typically have pockets of air and aren’t “sealed” with the lids so oxygen can pass through and remove the heat. I know with a fluval edge, people were recommending CPU fans to do a push/pull method (see pic for example) so that cool air could pass over the water and keep the temperature down. But with air movement creates more evaporation – It seriously becomes a Catch-22. the ADA tanks. I have my 12 long setup as a guppy fry grow out tank planted with microsword that’s completely carpeted. Fishkeeping and aquascaping really are enjoyable hobbies. Thanks for your article on the Mr. Aqua 12 long.